FS532 challenge - featured stamper is Sue Drees aka NEEDMORESPACE and she has a wonderful gallery. I might have to go back to do another card. I chose this amazing CARD. I love the swirly layer so keeping with the wonderful decorative layer I did two decorative layers of lace using Gina Marie dies popped the second layer on dimensionals. 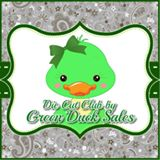 I used the Green Duck embellishment that has the umbrella to go with the umbrella on the FS card and added a welcome banner. I finished the card off with some sequins. Love the lacy look to this cute card......is it a punch or die that makes that lacy edge? Thanks Ann. The lacy cut is Gina Marie die cuts.